Image taken from marie claire, photo credit Rex. I've done some link-sharing in the past (here & here for example). As I get into my reading plans for the year--which I've carved out on my weekly plan & daily to-do list--I thought I'd get into the habit of sharing highlights here, all with the goal of connecting back to my mission to amplify voices. An obvious starting place this week is the #GoldenGlobes, which brought women's voices to the foreground (despite the near deafening silence from men beyond their #TimesUp pins & the commentary from Seth Meyers). 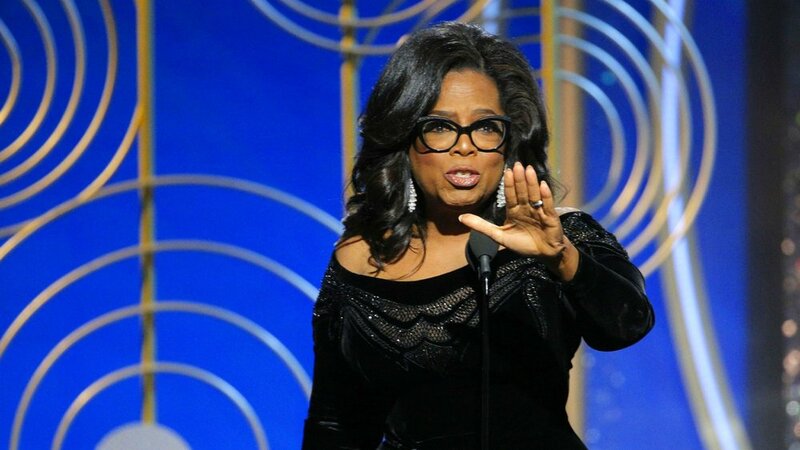 Here's a link to Oprah's full speech as she becomes the first Black female to receive the Cecil B. DeMille Award for lifetime achievement. Jokes or hopes about her 2020 presidential run aside, it was excellent to hear such a powerful, inclusive call for progress--one that used a phrase I turn to often when discussing how I conduct my political ecology work: the necessity of speaking truth to power. I wanted to learn more about the phrase & uncovered this quick read on its Quaker origins--as well as this one about Bayard Rustin's potential involvement & erasure from the work. I'd like to find more robust, reliable sources on the topic, but in the meantime I've requested Speak Truth to Power: A Quaker Search for an Alternative to Violence from the university library & look forward to reading more on nonviolence. I identify as a pacifist & believe in the power of compassionate resistance centered on our shared humanity, & I'm looking forward to putting more knowledge behind that practice. Scott Carlson's "When College Was a Public Good" over at the Chronicle has me thinking about Dewey, the goal of higher education, & the state of our universities. Andrea Long Chu's "On Liking Women: The Society for Cutting Up Men is a rather fabulous name for a transsexual book club" is incredible, intimate prose as she explores Valerie Solanas’s SCUM Manifesto (which I've also requested from the library) & her own identity & experience as a trans woman. Daniel G. Solórzan & Tara J. Yosso's "Critical Race Methodology: Counter-Storytelling as an Analytical Framework for Education Research" helps put this desire to amplify voices & practice intersectional feminism into an actionable place as we help students develop their critical thinking skills. I read this with Eve Tuck's "Suspending Damage," & it was a great recentering for thinking through how the narrative I build in my own work aligns, adjusts, or casts off standing narratives--and how this becomes an explicit choice we can & should each be aware we're making. So, there we have it. My first list of things I've enjoyed so far this year. I hope to keep this going & welcome reading recommendations. Hopefully, these will continue to somewhat neatly settle in on a theme.